In spending some time with Lisa and Ethan while they were in town this week, I took them over to the North Shore to explore a bit. 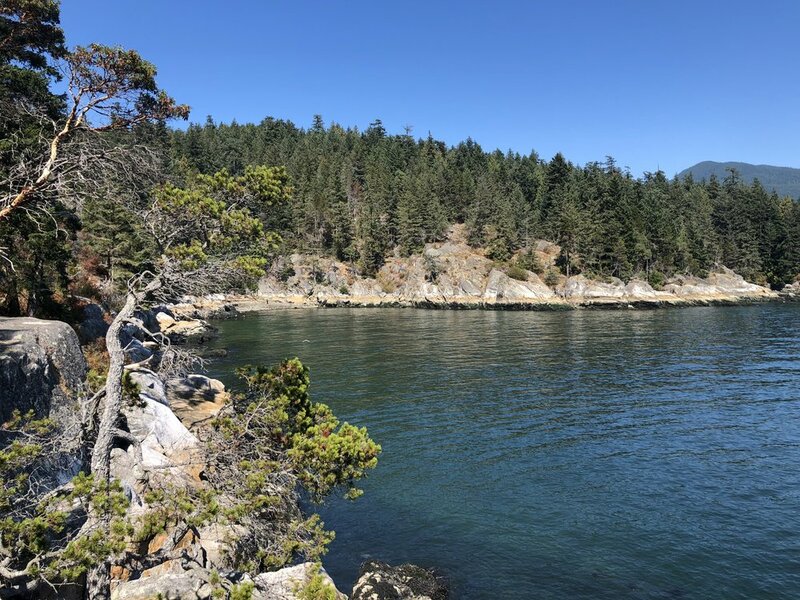 We spent some time in Lynn Canyon, then drove over to West Van to Lighthouse Park to explore and swim. Was a great day! 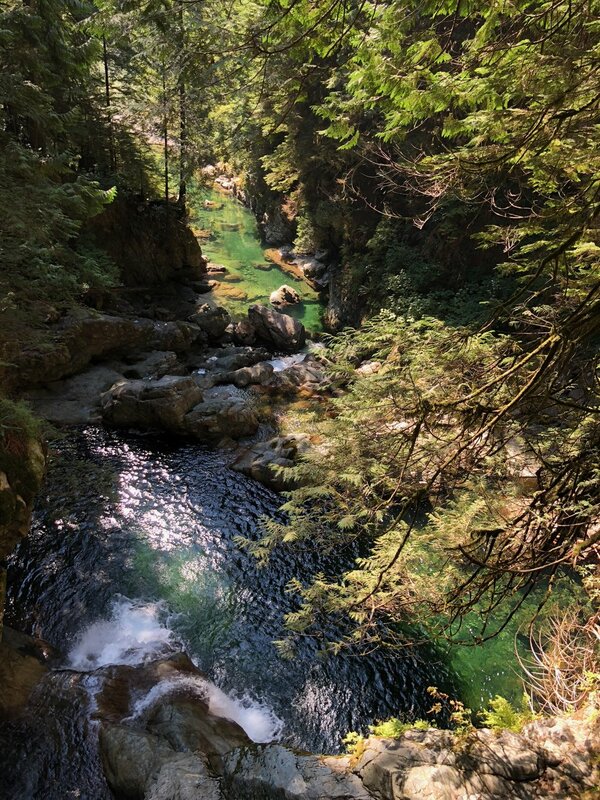 We started off by driving over to North Van and spent some time in Lynn Canyon. I never take people to Capilano, when the suspension bridge in Lynn Canyon is free! We spent some time exploring the park - Ethan found his first banana slug - and worked our way down the trail to find a place to access the river. The water level in the river was really low - lowest I've seen it. We eventually found a spot and spent a bunch of time in the water. 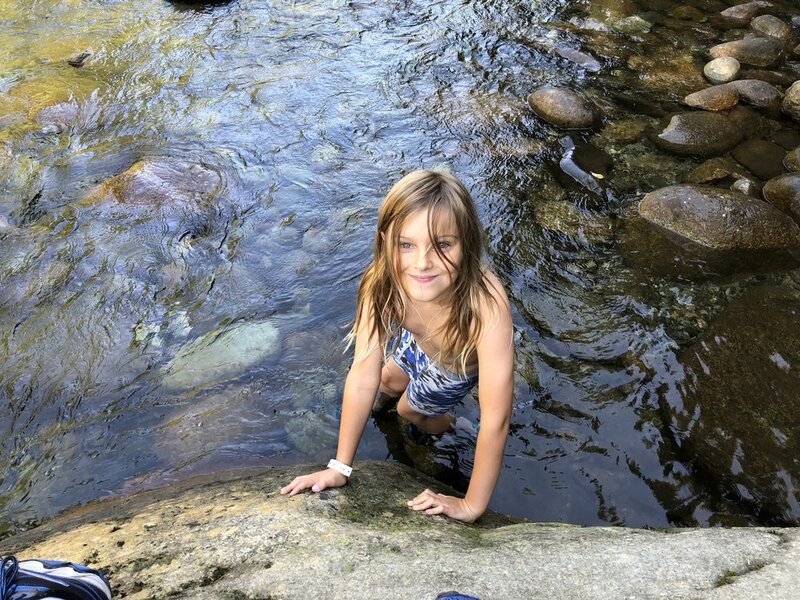 The river was cold (snow melt and all), but Ethan managed to get in and swim a little bit. After exploring the banks for a bit, we got Ethan changed and hiked back up to the parking area. We had some lunch at the concessions (the food is surprisingly good), then got packed up and drove over to West Van. 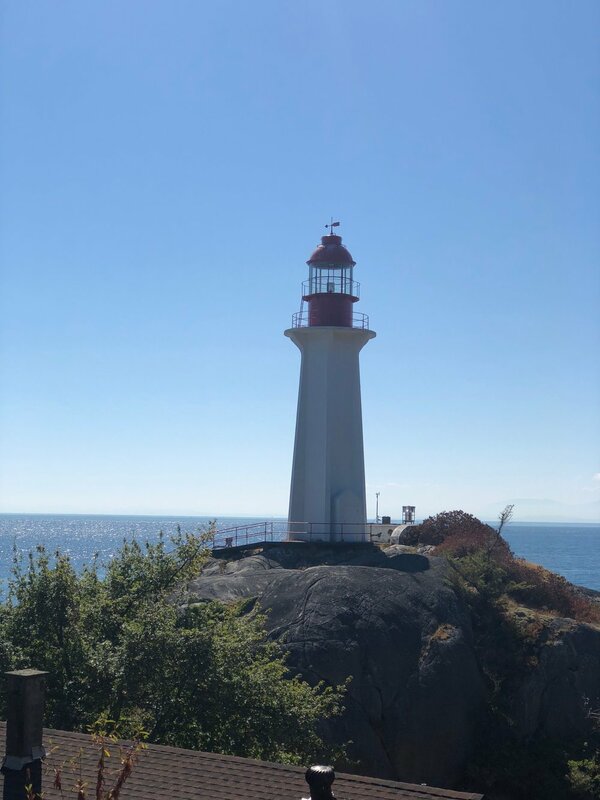 On our whale watching trip earlier in the visit, we had gone by Lighthouse point and Justine suggested it as a god spot to spend some time exploring. Us usual, she was right and we had a great afternoon exploring. We initially walked down towards the lighthouse, and were rewarded with the gates being open, allowing us to get a little closer. We look some pictures then made our way down to the rocky shore. We scrambled over some boulders for a bit, but the tide was out and there wasn't a lot to see. The lighthouse from the view point. One of the little cabins near the lighthouse. The lighthouse from the caretakers cottage. The view from the rocks. From the rocks, we could see a little cove that looked pretty ideal for swimming. There was a "path" along the waterfront that we scrambled over (and up, down and around), but eventually made it to the little cove. It was a bit of an adventure. Our scramble along the rocks - and a swim after. Eventually we got to the cover and the rocky beach. It was pretty good for a swim - a lot of debris in the water, but out past the rocks it got sandy, and it was deep enough that there were sea stars on the rock face that we could see easily. We swam for a bit, then Ethan played with the driftwood on the beach. A dead tree root, with some bushes bursting through. Our little beach - not sure what the metal thing is. After warming up in the sun, we eventually made our way back to the car. On the hike back up, we got to see a lot of really old, really huge trees. I didn't realize that Lighthouse Park had some old growth left in it. 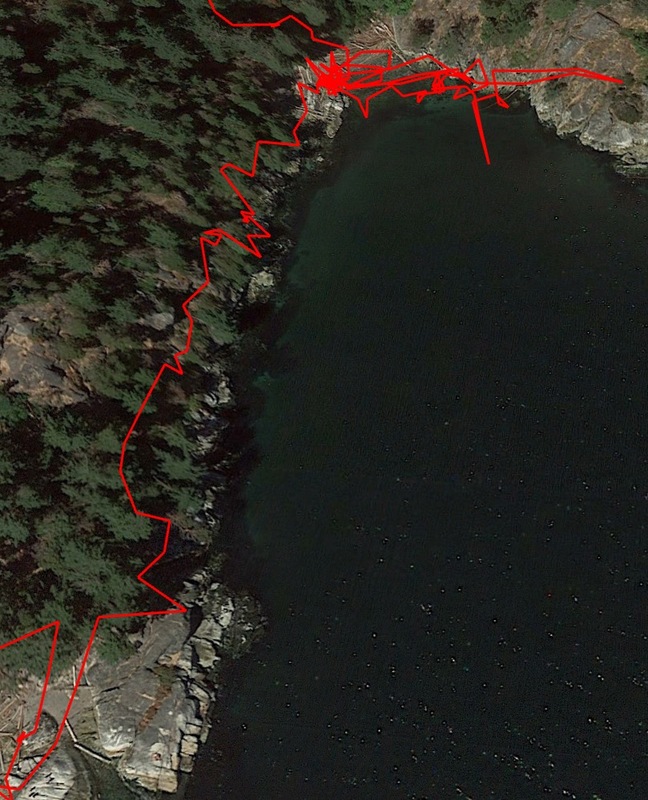 The full map of our hike (and swim) at Lighthouse Park. Such a fun day!